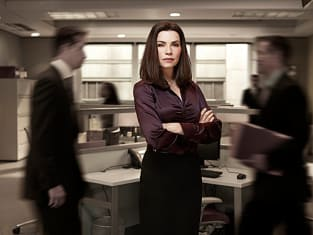 The Good Wife got right down to business on this past Sunday's return episode, taking viewers inside the crazy world of Lockhart/Gardner on "Alienation of Affection." Matt: David Lee confronting Eli Gold. The two most combative partners, mano-a-mano, at each other's throats yet, you could also tell, going at it with a tinge of respect for the other, as well. I loved it. Christine: It was the bickering between David Lee and Julius. They were like two brothers arguing over the same toy. It was so very funny watching them go at each other. Carissa: The quick conversation between Alicia and Cary as he got onto the elevator. I miss them. Elsbeth Tascioni as Will's lawyer: A good choice? Matt: No. A GREAT choice. Probably my favorite recurring character on television these days and the complete opposite of Wendy Scott-Carr. This should be interesting. Christine: Of course! I'm so glad she's back. She's smart and weird and you never know what she's going to do next. It's what keeps the opposition off balance. Game on. Carissa: Yes. She's loony, but is ridiculously clever. I would love to have her on my side. Will was right to bring her on board. Should Diane date the process server? Matt: Did you hear his accent? See him in action against that jerk of a recipient? How is this even a question?!? Of course. Christine: Sure. What the heck? Diane deserves a little fun and these two have some nice chemistry. Somehow Diane tends to find the most interesting men, doesn't she? Carissa: Speaking of loony, somehow Diane always gets involved romantically with the most unlikely candidates. First, a die-hard Republican and now a process server who won't hesitate to put someone in a headlock in the lobby of a packed office building? I like it. She's at her most human when she lets her hair down, and these odd fellows bring out her humanity. Rate this week's case on a scale of 1-10. Matt: 10. 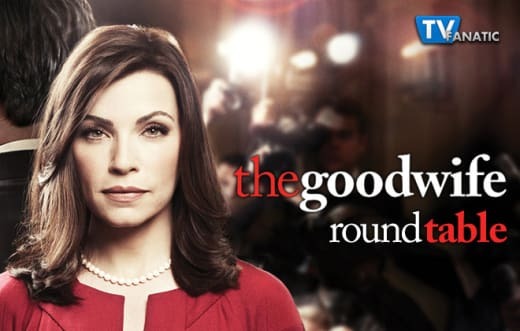 I've made it clear in my reviews that I'm more interested in the boardroom of Lockhart/Gardner than the bedroom of Alicia Florrick, so this case/episode had it all, giving various partners a chance to shine... or, in some fun cases, yell. Christine: 9. It had a little of everything. Alicia found out about Will's troubles. Alicia and Cary had that wonderful scene at the end. Kalinda scrambled to try and help Alicia. Diane had to smack Eli and David Lee back into submission. The episode was one of the most fun this season. Carissa: I liked the lightness in tone (even though they were all being sued and the Gardner case is coming to a head), so I'll give it an 8. It felt like an episode from last year, and that's a good thing.